Cesarean section, also known as C-section refers to a surgical method of delivering the baby through the incision of the abdominal and uterine walls. This method was initially utilized to separate the fetus from a moribund mother but the method later evolved to resolve a variety of maternal and fetal complications that couldn’t be resolved through a normal vaginal delivery. Currently, the method is being performed not only to resolve fetal and maternal complications, but also in deference to the patient’s wishes and preferences. The debate raging presently is about the high rates of cesareans being performed these days in developed countries for indications other than medical necessities. 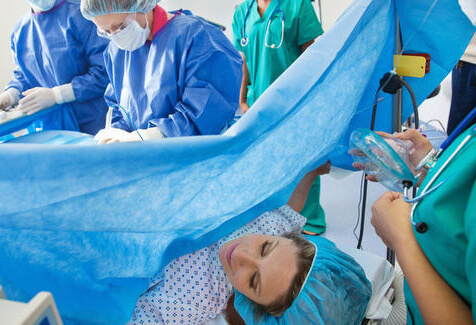 -A repeat cesarean delivery after the first one also being a cesarean. -Obstructive lesions in the genital tract and in the lower uterine segment that could interfere with the smooth passage of the fetal head. -Abnormalities in the pelvic such as a fracture or dislocation that would interfere with the descent of the fetal head. -Pulmonary insufficiency for a normal labor in the mother or the presence of some cardiac condition. -Malpresentations of the fetus, such as cases of breech presentation. -Congenital malformations such as a large hydrocephalus or other skeletal disorders. -Prolonged labor leading to stress on the baby or in cases of prolonged acidemia. -Situations where morbidity or mortality could be reduced by the trauma of vaginal delivery. Indications for cesarean delivery where both the fetus and the mother get to benefit include situations where the placenta is in an abnormal location or when the labor is delayed due to cephalopelvic disproportion, etc. The pre-operative preparations for a cesarean delivery include fasting 8-12 hours minimum from a regular meal and a time gap of at least 2 hours from having taken clear liquids. The impending parents need to come to the hospital fully prepared with all the paraphernalia needed for the baby as well as for a few days stay in the hospital for the mother. Usually an IV line is set-up and fluids infused through it prior to commencing surgery. Pre-operative prophylactic antibiotics are also started off to decrease the risk of endometritis and other infections. An external fetal monitor is put in place over the abdomen to monitor the baby’s vitals, and various other monitors set up to follow the mother’s blood pressure, pulse and oxygen saturation. Prior to the cesarean, the blood work-up will be done along with a final evaluation by the surgeon and anesthetist. The entire delivery procedure gets over in less than an hour. The cesarean delivery usually involves either a vertical or a transverse external incision followed by a transverse hysterotomy incision and fetal delivery; this is quickly followed by uterine clean-up, repair and closure.